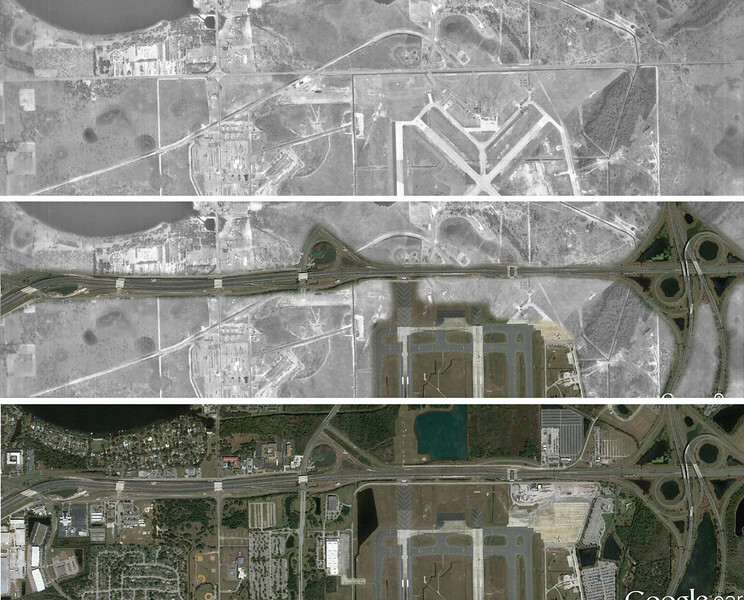 An interesting comparison of 1947 and 2016 aerials illustrating the impact of expressways penetrating through various Orlando neighborhoods and districts. 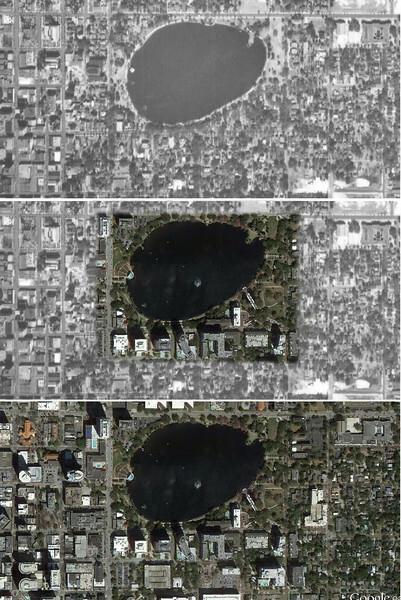 Just east of downtown Orlando, Lake Eola Park has been around since 1888 and officially since 1892. Expanded in 1999, it has been a popular place for infill high-rise residential and mixed use projects over the last 15 years. 10 miles south of downtown, Orlando Army Air Field #2 opened in 1942, as an auxiliary airfield to the Orlando Army Air Base. With the establishment of the U.S. Air Force in 1947, it eventually became known as McCoy Air Force Base. Prior to the opening of Walt Disney World in 1971, it was the area’s largest employer. In 1962, an agreement between the Air Force and the City of Orlando resulted in the joint-use of one of its runways for airline operations. Following the 1973 cease fire agreement with North Vietnam, the base was closed in 1975 and converted into Orlando International Airport. During the late 1960s and early 1970s, the Beachline Expressway was constructed between I-4 and the airport.